It is hard to believe that the song/poem was written in 1844 by an excited young New England boy who couldn’t wait to get to Grandma’s house for Thanksgiving dinner. It was a tradition. I remember that excitement too, when as a child, my folks and siblings drove through snow, over roads and bridges, crossed Highway 10, and down a couple long dirt roads before pulling into Grandma’s and Grandpa’s house. Cousins from Waite Park and Iowa as well as aunts and uncles traveled their distances too to share this holiday with loved ones. Along with a huge dish that was replenished often before the actual feast began, we gathered around the fold away tables and talked, laughed, and giggled. It was our tradition. Join vendors, crafts people, and artists at the Long Prairie Arts and Crafts Show and Tell tomorrow from 9-4. I’ll be selling and signing my books, and we will be selling Jennie’s Clearwater Apothecary Pure & Simple products–creams, lotions, soaps, and balms! If you haven’t done so already, make it a tradition! November 18, 1307, is a famous date for history lovers…This day in history it is alleged that the Swiss-born William Tell shot the apple off his son’s head. In a nutshell, apparently Bill refused to bow before the hat of a Habsburg ruler and was ordered to be killed unless he shot an apple off his son’s head. An expert bows man, he did that and more–he split the apple in half, thus saving his life and his son’s. Unfortunately, Tell was a rebel and big talker and swore that if he’d have killed his son, he would have turned the bow on the ruler. After being taken prisoner, he escaped chains, killed a ruler, and eventually led a revolt against the Habsburg governance. So what is this history lesson all about? Lots of events linked to November 18–and one is in Clearwater, Minnesota, this Saturday at the Lions’ Bldg in Lions’ Park on Highway 75. The 2nd annual arts and crafts sale will be held at 10 a.m. to 3 p.m. There will be crafts, wood products, and direct sales items, arts and décor, and ME and my sister! Totally bad English-speak for a retired English teacher. We will be there though–I’ll be selling Clearwater books, signing as well, and sis will be selling Jennie Phillips’ Pure & Simple products–lotions, creams, balms, soaps, and a host of Clearwater memorabilia. Check out the site–you may have to copy and past in the URL. I’ve heard that this is also a fun and large event to attend. I’m not sure if there will be any competition you can join in on with crossbows and apples, but you may hit the bull’s eye and bring home bargains galore and as you take shot at your Christmas shopping list. Hope to see you at either or both events. The other night I saw a recent, 2017 film about Helen Reddy. I remember her standing thin and tall singing, “I am woman . . .hear me roar . . .I am invincible . . .I am strong!” I was so surprised, though, to see how she had changed because I’d never kept up with her success. She is nine years older than I am. What did I expect? I haven’t been thin for 35 years. If I hadn’t been coloring my hair, it would be gray like hers. She is probably still tall–I haven’t a clue–but she has “grown,” as the song goes, in a number of ways. She states she is happy with how she has turned out, feeling as though she has turned into the woman she sang about in the 60/70’s. “I am woman,” which she wrote, became a mantra for the women’s movement. She is still active in women’s empowerment, attending, singing, supporting, and speaking at conventions, conferences, and marches around the world. Most of us have had an opportunity to see on television how some women are coming forward, finally, to indict those who have hurt them. It’s amazing what women can do when they stand together. There’s power in numbers. And, yes, it is time to whip the bullies, the woman bashers, the sexual perverts–anyone who hurts others. Scruples & Drams and my upcoming novel, a sequel to Jennie’s story, Needles & Pins, Maude’s story, promotes strong women. These women stand up for other women who are caught in trouble–trouble they can’t handle by themselves. This weekend, Sat.,November 4, I’ll be selling Scruples & Drams, Around Clearwater, and Postcards from the Old Man at the Monticello Women of Today Fall Craft show in the Monticello Community Center from 9-3. The address is 505 Walnut St # 4, Monticello, MN 55362. My sister, her friend Pam, and I will be setting up Clearwater Apothecary with all sort of products Jennie Phillips would have made or sold in her shop–such as her famous Pure & Natural, wild rose facial cream, dry hand rub, skin lotions, soaps, cards, bags, and crocheted hats, gloves, and scarves. Come out and support the Women of Today! Thirty days hath September. . .
August was so nice and fall-like; I wasn’t surprised when September brought a heat wave, and it did last weekend. I don’t like pushing the seasons, but last weekend was pretty nasty as I sat out in the elements–wind, humidity, and sun. I can’t believe that I hardly burned all summer even on my son’s pontoon. Then my last book event in September gave me a whipper-snapper of a blaze on my neck and arms as I sat greeting, meeting, and selling books at Millstream in St. Joe. I heard my grandchildren came in from outdoors and asked their dad when fall was coming. They like the rest of us who live in the Midwest expect our changing seasons. Now, we have it–for now–cooler temps and rain. Yet, it is strange not to have more colorful trees. Not all maples have turned yet. Even though the woodlands aren’t at peak, they give a tinge of what is to come–crunching leaves, cooler temps, cuddly sweaters, meatloaf and baked potatoes (in the oven as I write), apple pie, and …sorry–ice roads. But wait–we have time before I have to put away capris and my good friend Carol has to put her sandals to bed and hide her beautiful toenails in real shoes. This next weekend, Oct. 6-7, I will be in Mankato for the Deep Valley Book Festival. Friday night I will be hobnobbing, or as my friend says “hobsnobbing,” with other authors at their Authors and Appetizers Gala event. Now what to wear with a ugly beige boot that protects my weak ankle? I still want to keep that, “I’m just Cindy look,” pretend I am not that blind, deaf, gimpy girl, someone I know and love calls me, and still put on an air of dignity. The next day, I will be selling books in the Mankato Civic Center and reading from Scruples sometime after 4. Don’t miss me; I’m the last reading. In October I will be preparing for a few indoor events–arts and crafts. I’ve had a few people ask me when I’d made more of Jennie’s Pure & Simple products–like Jennie’s wild rose facial cream. I will be as soon as I get back from Mankato. If you need to order now is the time because I’d like to know how much to make. My sister is making up soap so if there is something special send us word as soon as possible. I’m still writing the essay about the first ordained female Methodist minister in Minnesota. Not so slow, but I’m still finding information about her. Anyway, this is just an update on a cold, wet Sunday afternoon. Hopefully, I’ll be finished with that soon. November brings an arts and crafts festival in Monticello and the last weekend before Thanksgiving takes me to another arts and crafts in Long Prairie. All of my products and books would be great Christmas gifts so hope to see you soon. I’ve experienced all types of storms. When my husband and I visited Fort Sumter sometime between 2000-2005, we experienced the beginning of a hurricane. The park personnel took us out by boat to the site, but hurried us and cancelled all other tours. I felt like I had been wrapped in Saran Wrap. The hot and humid wind bathed me in salt. I trusted the guides to get us back to Charleston before the true storm began but I was nervous anyway. By the time they returned us to the harbor, most of us were rain, sweat, and salt-water-logged. My husband decided that we had time to tour the Yorktown, an aircraft carrier used during WWII. This took an hour or so as we nearly ran the through the ship to see as much as possible. He also decided to tour a submarine that was also there. I didn’t go–I don’t like heat and I am claustrophobic as well–no way I wanted to enter a sardine can. The husband had pretty much dried off from our trip to Fort Sumter, but when he climbed out of that belly, he was drowning in his own salt-water. Sorry, to be so descriptive. We headed out of town, following the parade to get as far away as possible. We ended up in Columbia and stayed in a hotel. I have no idea where those who were locals escaped to avoid this bullying storm. Silently, a wizard’s cauldron brews. a smoky black cape twirls toward the sky. crawl into the fruit-jarred tomb. when father closes the lid. Lions roar above our heads. Quaking cellar ceiling rages dust. ogling scarecrow eyes and gaping mouths. no ruby-red slippers to claim. to collect our copper hopes. When my husband and I and our two sons moved to South Dakota, we thought growing up in Minnesota, my husband from the Iron Range, that we had seen all that nature could provide in the way of blizzards. The one that hit in 1966 kept me and my friends home from school for quite a few days. My father who worked in St. Cloud had to sleep at the foundry. Can you imagine–no shower, little food, and black dust–for days? YET, we had been in SD only a couple months when I was caught in a white-out so strong I plowed into a snow-mountain caused by the blizzard and lake effect winds. I had to climb through piles of snow to a house to phone my husband (at least 10 years before cell service). HE did not believe me. He mocked me as he directed me to drive out of the mountain. The woman whose house I stopped at was really worried that a snowplow would shove my car further into the snow. Finally, after husband promised to come save me, the snow plow came barreling down the street. I caught him in time before he shoved my car into the lake. He pulled me out and I followed him at a distance until I got home, the road closing behind me as I drove nearly blinded in white. When husband got to our house an hour later, he said he was absolutely shocked in how much snow had come down and how bad the blizzard was. He had to take the long way around the lake to get home. We learned then and there never to trust a prairie blizzard. Laura Ingalls Wilder didn’t write these stories about nasty Dakota storms for nothing. She and we lived them! Thankfully, in all my storm experiences, I haven’t been left without homes or loved ones. I never had to pay $7 a gallon for gas to escape destruction; I’ve never been without water. I’d NEVER listen to the idiot national radio personality who calls Irma fake news. (NOT HYPERLINKING THAT COMMENT) I would listen to weather experts who sake “GET OUT OF TOWN!” It is always better to be safe than sorry. My thoughts and prayers go out to the many people who have recently faced flooding I can’t imagine and now another Hurricane Irma staring down on others. I hope we all remember Salvation Army, Red Cross, and evacuation centers with our offerings. Help starts with all of us. It is amazing how powerful our nation becomes when we come together unite for an important cause. 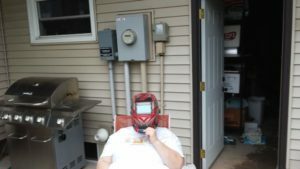 Cindy using husband’s welding helmet to look at the eclipse. My sister sent the link to me because she was so impressed with the singers of the song. She was so right! I hope you take a few minutes to listen and watch a new spin on John Lennon’s classic because it is for our times–now. From my writings, you know I am interested in women’s issues–health, history, welfare, etc. PBS aired 3 hour-long segments about the history of women’s suffrage in Great Britain–Suffragettes Forever! Women in America faced some of the same challenges, but maybe, not so violent. Women could be sold on the auction block like a slave, cow, pig, or horse. One woman was sold as late as 1917 for a pound. Women who voiced opinions were called scolds and husbands might force them to wear a bridle. Usually, the men dragged the women behind them throughout their villages, and sometimes the women were forced to stand in a public square to be publicly ridiculed and even labeled with words like “nag,” or “scold.” For centuries, many people, men and women, believed if a woman thought too deeply on anything she might damage her chances of fertility, thus the belief women shouldn’t be allowed to vote or take public office. Jennie in Scruples & Drams, and Maude in Needles & Pins do what they do to help women survive. Some may not always understand why they do what they do but this is history. It happened. Women had no one but other women to help them. They had no rights, no medical advice, no maternity help, no fertility information due to the very controversial Comstock laws that were passed. Women were powerless–until they stood together. There are good fights, holy fights; think of the Boston Tea Party, the American Revolution, the 1963 March on Washington for Civil Rights, Women’s Suffrage, Vietnam War, and so many more like Gay Rights. 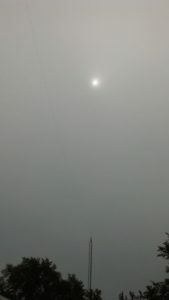 the eclipse here in MINN…a break in the clouds. fighting the good fight, marching for the truth, and Praying for peace, people, everywhere. AND don’t forget to IMAGINE! T.C. Porter, shoemaker, fur trader, farmer, legislator, Clearwater founder, husband of Abigail Robinson Camp, and father to Jessie Maude Porter, the village’s oldest citizen who died in 1962. This year I’m doing something a bit different for Clearwater’s Heritage Days in Minnesota. I’m rendezvousing with others below the Clearwater dam in Lower Park. Come on down and see where Clearwater, or Clear Water as it was written early in its history, first began. One fur trader you could imagine meeting down here is a village founder, Thomas, T. C., Porter. Born in Norristown, Pennsylvania in 1826, young Tom left home with a shoemaking trade to support himself when he moved to Missouri for a short time. A half-brother he referred to as Lafe set him up in the fur trading business. From there, Tom took a riverboat up the Mississippi and landed at St. Anthony where he, his cart, his two oxen, the first in the Red River ox trade business outfitted with two oxen, beaver pelts, and other supplies to trade at Pembina and Fort Garry in Winnipeg, Canada. He made acquaintances with other fur traders and members of the Selkirk Colony, including the Metis, those great crossed-culture peoples of Scotch, Irish, French and First Nations. Eventually, T.C. settled down to help develop the village. He became a farmer, held many positions in the community government, and became a state legislator. 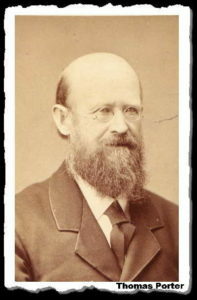 He married Abigail Robinson Camp, the first white woman to come to Clearwater, who gave birth to Jessie Maude Porter in 1862. Clearwater’s oldest pioneer. She died when she was 103. Lower Park, or Riverside Park, in Clearwater. 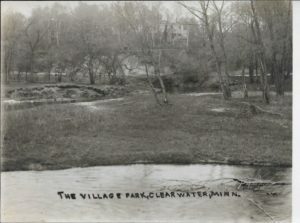 Do you know that here in Lower Park the village began? Thomas Tollington, his house is still standing up the hill on Spring Street, opened a saw mill down here. He became a furniture builder and an undertaker. Other people like H. C. Wait, (he is the namesake for Waite Park) opened a feed mill called the Clearwater Roller Mill. Don’t forget Pat Quinn’s first saloon, a sample room, was down here as well before the 1897 flood swept it down the Mississippi, taking the Catholic church historic records that he was storing with it. The Lynden Township Hall also stood down here. The bridge across the Clearwater River that led up Main Street. History is what heritage is all about. 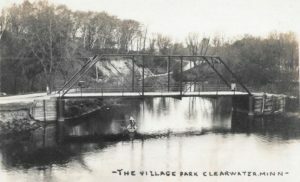 Without the village’s early history that links it to places all over the United States, Canada, and Europe, Clearwater Heritage Days would hold no meaning. So come rendezvous with me, my sister, and other more official land and water travelers down at the park. Recognize their deep culture as they exhibit the skills needed to survive in the varied elements. Watch them exhibit their daily routines of cooking and cleaning their campsite. Talk with them about their lifestyles, the dangers they faced on their journeys, what and how they ate and slept. I’ll be selling my books, Scruples and Drams, Around Clearwater, and Postcards from the Old Man. In addition, my sister and I will be selling some of Jennie’s Corner ephemera. Unfortunately, due to the climate, we cannot bring Jennie’s Corner element-sensitive products like soaps and lotions. I am not a morning person (nor am I an evening person), but I’ll try my hardest to be set up or at least present in the park by 9 a.m, Saturday, August 5. A Chinese proverb states: A journey of a thousand miles begins with the first step. I made that first step over two weeks ago, and I am finally home. I started writing my blog before my husband and I left for a few days of vacation in northern Minnesota to stay with friends and visit relatives over the 4th. Once I got home, I slept in my own bed for one night, and after repacking, I hopped in my sister’s car for another rode trip the next morning. I had a nice time from north to south, and was surprisingly blessed with new information for the article I have been researching and writing about my minister, Mary MacNicholl. I have been excited to learn about her, her family, and her climb to become the first woman ordained Methodist minister in Minnesota. This work has taken me on a journey that I never realized I’d take. Now home, I decided I would finally finish this blog before July ends so I can get back to my other writing. I love the 4th of July. It’s a time of celebration with friends and family. This year, our newest baby celebrated with us–her first 4th and probably her first parade. Even though my husband and I have travelled a lot, we’ve never been anywhere famous to take in parades and fireworks, we have seen some wonderful exhibitions across the United States. For the last years, we have gone to Ely, MN, my husband’s hometown. Ely is proud of its heritage. Definitely a city like many on the Iron Range built from the backs of the miners or foresters who were immigrants from Slovenia, Croatia, Italy, and Finland, and other countries, the generations that followed were proud of their heritage in America. Everyone gets into the act to make this day special. The parade begins at 1:00. Many of the town people place lawn chairs at the same place each year in front of Zup’s, (the Slovenian grocery store,) up and down Harvey or Sheridan streets to watch the lawn chair ladies, the Klown Band, and lots of floats with kids spraying guns of water on the over-heated watchers. After some tour around the beautiful countryside where hills and trees rise up and circle the crystal lakes before gathering for picnics of traditional American of Zup’s own Polish sausage, hot dogs and hamburgers, and maybe some homemade walnut or apple Poteca. Once darkness comes, the sky blossoms with the most amazing colors as fireworks, private and public, ending the day’s celebrations. A number of times as my husband and I headed home from Ely to South Dakota (we lived there for thirty years) because we had to go to work the next morning, we could see north, east, west, and south as the sky blasted on fire. We could only imagine and mimic the universal “oohs” and “aahs” being shouted and car horns being honked during and after these night sky displays. Just like James Cagney’s “Yankee Doodle Dandy,” we feel patriotic on this day; we love to kick up our heels. Eight hours later, we pulled into Anamosa, where our aunt lives–our sole reason to go to Iowa. We visited, we laughed, she told us stories, we ate with the cousins, children of cousins and their children. Of course, before we left, we did some antiquing and viewing Grant Wood landscapes. “American Gothic” and his other works are part of the culture in this small town where he lived. As we headed north, we could see how rural scenes of neatly plowed fields and rolling hills captured Wood’s imagination. We stopped for the night in Spring Valley, Minnesota. Of course, no trip is complete for me without fodder for more writing. Now what is so spectacular about Spring Valley? Ah, Almanzo Wilder’s parents, Laura Inglalls Wilder’s in-laws, settled here and the United Methodist Church in Clearwater, Minnesota, received their woman minister from the Methodist church there. From childhood on, I have been a Laura followers, and I used Laura’s life for part of my master’s thesis. Now, I said I’d get back to Gr Gr Grandfather George Potter. He was born in Franklin County, New York, just a few miles from where Almanzo was born. It gets to be such a small world, even if we don’t know if the families knew each other back in New York. 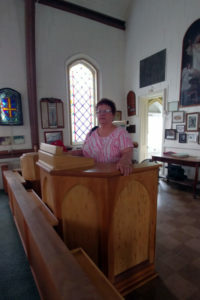 Spring Valley’s museum is in the old Methodist church where Reverend Mary MacNicholl preached. The United Methodist Church Museum in Spring Valley. Wilder mementos as well as other notable citizens fill the building top and bottom. The historian told my sister and I that they have so much as far as historical objects that the history society has filled barns, sheds, houses, and of course, the church. From the theaters cameras invented by the Conley brothers to watches bought by Richard Sears for his mail-order catalog (the one in who is the Sears in Sears and Robuck) and who was Almanzo Wilder’s boyhood friend. The Spring Valley historical society is proud of its heritage and attempts to house anything and everything given to them. As far as Miss Mary goes, she preached in this now museum-church with its beautiful Italian stained-glass windows, dating back to the 1700s. The story goes that way back in Italy, a church in England commissioned the glass company to make and design these windows. For some reason, they backed out of using them. They were stored somewhere in England and forgotten for nearly 100 years. From the church’s inception, the windows have shone light on the parishioners in this Spring Valley Methodist Church for 100 years and still graces the sanctuary. Miss Mary received her ordination here before transitioning to Clearwater where I grew up and where I and others appreciated her spiritual guidance. I stood at the altar and tried to imagine Mary singing in front of her congregation, blessing and serving communion, or baptizing babies. I received a wonderful gift from the historian. She gave me pictures of the church, the rectory before it was torn down, and Mary and her mother Mary who had come to Minnesota to be her housekeeper. Here is a community that loves its history and is proud to display it!!! A small detour before we finally headed home was to Wykoff, Minnesota, just ten miles away from Spring Valley. This was Mary’s first church, along with two others in Fillmore County. This was Sunday about one o’clock. I didn’t expect to see anyone come from the church so my sister took pictures of me standing on the steps. It was a warm day so she went back into the ac of the car while I wiggled the door handle. Finding it unlocked, I slipped into the entryway. Little rooms off to the side were carpeted and there were steps to the basement. The sanctuary doors were open. I walked to the front pew. As I sat down, I thought about all I had learned about Mary MacNicholl since I had started this process. She received her divinity degree in the late 40s and left her home in New Jersey. She became the minister she wanted to be from childhood. This was the first church she served along with Fillmore and Fountain –a three-point charge. Brown paneling and red carpeting welcomed me. I could imagine this peaceful sanctuary welcoming her as well. I remembered the first day of my teaching career, and I could imagine the preparation she put in for her first sermon. I sat for awhile, and then it was time to move on. I closed the door behind me, but I didn’t lock up. I left the building as I found it. As we drove away, heading home, I was impressed with how Mary faced many challenges to become a minister in a man’s world. I refrain from breaking out into song about our country’s freedoms and opportunities that are available to men and women alike. (I am sure you are thankful for this.) My hope is that we can feel the fourth of July every day so we can put behind our differences and celebrate our Americanism. He had a rough beginning, but he seldom dwelt on it. Maybe I’ve blogged about Dad before. He was born and raised on a farm north of Yankton, South Dakota, to Fred and Anna (Hauck) Frank, children of immigrants from Russia. Both of his parents’ had strong family ties with lots of friends and relatives in the Yankton, Scotland, and Menno areas. An article in the February 14, 1920 Scotland Journal announced that the area had been free of the flu so far that winter. Less week later, my dad’s family all came down with the dreaded virus. Grandma and Grandpa Frank died on the same day, February 21, 1920, with Dad’s little brother Eddie dying on the day of his folks’ funeral. 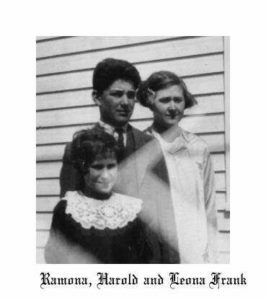 The three living Frank children went to live with Uncle Chris Hauck in St. Cloud, Minnesota. Aunt Leona was nine, Dad was seven, and Aunt Ramona was two. Later, the children were split up and fostered by different families. The picture below on the left was taken after Aunt Leona’s confirmation and the last day the three siblings would be together for many years. Aunt Leona’s family moved to Idaho. In fact, even though Dad and Aunt Leona corresponded, they didn’t see each other for forty-five years. 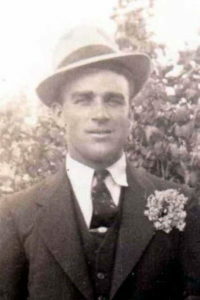 Harold Frank about twenty – five years old. As the song goes . . .Dad may not have “been much in the world,” but he was the world to me and my siblings. He went to work every morning clean as a fresh-washed copper penny, and after working hard in a hot iron foundry, he came home every night covered in black dust. He taught us right from wrong, taught us about his love of God and the Bible, guided us in faith, and he modeled a life to be followed. He was a quiet man with few wishes or needs except for a good chair to hang his leg over while he read his newspaper, a transistor radio to listen to his Minnesota Twins, a good hamburger anytime, and a beer to quench his thirst after mowing the lawn. He also told us about our German-Russian heritage, which had been taught to him by his parents and later by his foster parents who were his first cousins. So important to him that it was important for my sister to begin researching our lineage. I took over when I moved to South Dakota. I eventually found that our Frank, Engel, Jasmann, Mueller and other relatives were the first German Russians to come to Dakota Territory in 1872 and settle in Odessa Township, Yankton County. I wrote Steppes to Neu-Odessa: Germans from Russia Who Settled in Odessa Township, Dakota Territory, 1872-1876, a biographical dictionary of these first settlers. A bit of the orphan came out at times–like when Dad remarked that he never thought he would be so lucky to have a family. But I can say we, his children, were the lucky ones to have such a good father. but let your heart keep my commandments . . .
Hilex baths for itch and ground-in dirt. The old man had cures for all our family’s ailments. stinking of gasoline and spruce, contained a mystery. and while I wept in pain, Dad performed his magic. my wounds with a Band-Aid, gauze, or clean rag. delivered through my father’s hands. 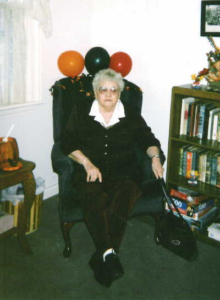 Cynthia Frank-Stupnik’s mother Winnie Frank in November 2002. As an author, I mostly focus on women’s studies and women’s history. I especially enjoying writing about strong women who have made an impact in the world. Did you know a woman named Anna Jarvis, as well as many others, lay claim to founding Mothers’ Day? My family and I had a nice Mothers’ Day hosted by my oldest son and daughter-in-law. Good fun, lots of good chatter, grandchildren, and May birthday celebrations with a BIG cake were the order of this day. On top of all that, good weather! What could get any better? When I returned home, I turned on TCM and saw that one of my favorite old movies, I Remember Mama with one of my favorite actresses, Irene Dunn, was playing. This mother was the heart of the family as my mother and my grandmother were. Honored once a year, these women represented the models most of us appreciate. 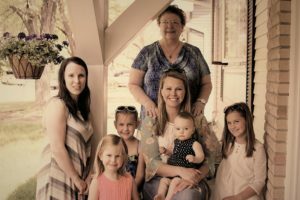 I have many happy memories of long-ago Mothers’ Days when my own “Mama” and grandma were still around, yet my own Mother’s Day, the ones I share now with my daughters-in-law and granddaughters, is even more special. This day that was devoted to my mother and everyone I knew began in Sunday School. In the musty church basement, I created the same things for a number of years. From the pail of broken color crayons, I with others crafted our card of love on construction paper. From scribbles that the teacher addressed “To Mommy” from “Cindy” to more ornate three-dimensional pictures I designed when I was older, my greeting accompanied a paper cup of petunias or marigolds. Right after the last stanza of “This Little Light of Mine,” I ran up the steep steps and out the door to the waiting car where my mother sat. I offered her my precious gifts by dumping them in her lap before hopping into the back seat so Dad could drive us to visit Grandma and Grandpa for a family get-together. Grandma welcomed us along with our other aunts, uncles, and cousins. My mother and her sisters gave their mother flats of pansies, her favorite flowers. If it was warm, we ate outside and always, always, the center of the table held glass bowls heaping with glistening olives, green and black, as if they were the most precious gems in the world. Anyone passing the table grabbed a few from the bowls which Grandma or aunts filled as fast as they were emptied. When dinner was over, as the men sat around yakking in the lawn chairs, Grandma’s daughters, my aunts, cleaned up the table, scraped plates, packaged up leftovers and washed, wiped, and put away the dishes. Then they all knelt in her rock garden and planted the flowers for her. Not much changed in Sunday School over the years, and when it was my turn for my sons to share the same gifts with me, the hosting batons were handed down to others. I remember the joy I felt when the boys were little and presented me with their teacher-planted petunias and their special handiwork on their cards. Their etchings were usually flowers and rainbows, and I showed them off on the bookshelf until I put them in my drawer of memories. Their flowers seldom survived. They were replanted and often drenched with loving care. For years, especially after Grandma could no longer throw big parties, my mother’s baton became the potato masher as she became hostess for this special day. I don’t remember planting flowers in her garden because my dad and sister pretty much handled that, but I remember big family hugs, lots of laughing and talking, a few hands of 500 around the dining room table, a Twins game blasting on the TV in the living room, lots of food–all garnished with the same center pieces–green and black olives, and the dishes–stacks of plates, platters, and serving bowls, and silverware that usually my sister and I tackled with our batons, a wash cloth and drying towel. I can still handle the cooking if I have to, but life and traditions change. Daughters-in-law and sons usually alternate the holidays and activities with us. Other things have changed as well. Although we often have olives, they aren’t the center pieces. Sometimes a baby sits in the middle of the table. We have other tastes as well. I ‘m not sure what my grandparents or parents would have eaten without turkey or ham. Now we often have pulled pork sandwiches or someone’s fired up the b-b-q. We eat salads of all kinds. This time, because I was hungry for it, I brought tomatoes and mozzarella that my daughter-in-law garnished with balsamic vinegar and olive oil. I doubt my grandmother or mother would have had these in their pantries. 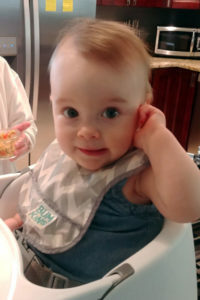 Holidays like Mothers’ Day are still traditional, a time for love, a game of Old Maid, and giggles with the grand kids. As far as I am concerned, anytime I can see my family, it is Mothers’ Day. Thank you sister for such great photos. They bring a smile to my face, and I ache to see them as soon as possible.